A stretch bib pant that looks as though you're wearing your high waisted overalls to the mountain. The women’s Burton Avalon Bib Pant features stretch paneling at the center back for unrestricted mobility and to keep snow from sneaking inside. A chest pocket keeps everything in it’s place, while fleece-lined handwarmer pockets also store keys, phone, or cards. 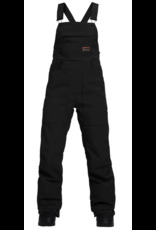 The classic overall suspender system also includes a drop seat feature that works seamlessly under a jacket and allows for easy bathroom breaks. Thigh vents allow for ample venting to prevent overheating.